First, happy birthday to Aunt Leigh! We had grand plans for brunch and I even purchased a fancy cake but Miss H had different plans. Well, it was not just a burp. And, it was all over her and my car. I called Kerry to let him know that someone did not feel well and I needed some cleaning supplies. While I got Miss H cleaned up, he cleaned my car. The rest of the evening was more of the same. I started off the week with a trip to urgent care for bad asthma symptoms and we were ending the week with the other two members of our household feeling like crud. 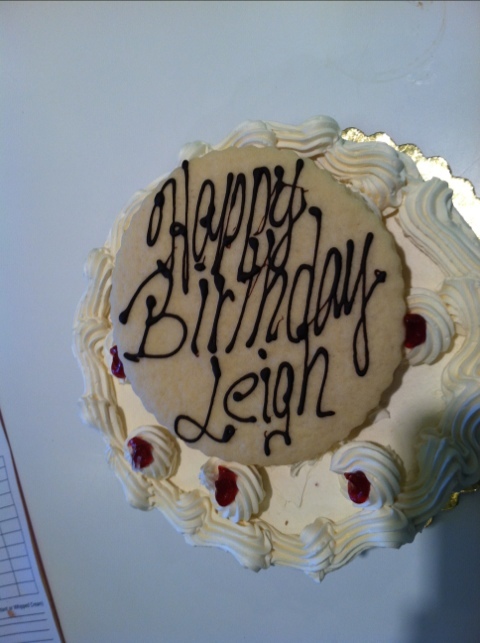 Aunt Leigh- we hope you have a great birthday! We totally understand why you have avoided us. We have your presents and just so you know, the cake is delicious!